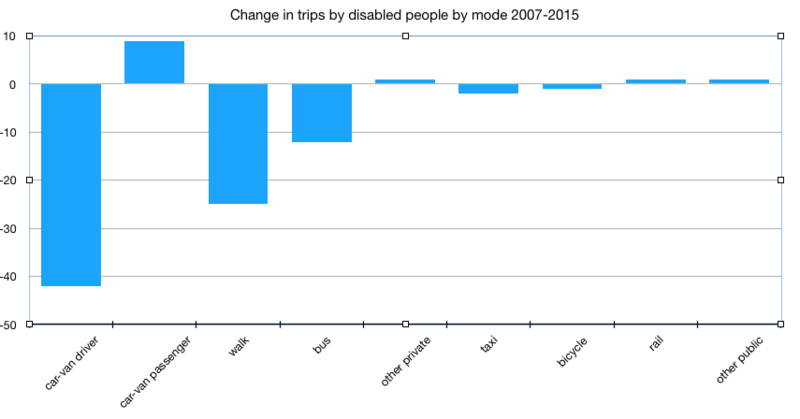 I have updated tables showing the number of trips made by people with mobility difficulties in England by mode of transport, taking account of statistics published by the DfT for 2016 and 2017. Disabled people continue to travel significantly less than people with no mobility difficulty. They make more trips as a car passenger and by taxi; and markedly fewer trips by rail and or by bike. Here is my evidence submitted to this Inquiry; I know that my principal point - that the balance between walking and cycling is all wrong - may not be universally popular but needs, I think, to be said! I’ve published this new analysis of disabled people’s travel using National Travel Survey data for England from 2007 to 2015. This shows the different pattern in the use of certain modes of travel between disabled and non-disabled people, and how travel has changed over time. The most striking finding is that travel by people with mobility difficulties fell by every mode of transport recorded except one. The single exception was travelling ‘as a passenger in a car’, which increased slightly over this period. This suggests that not only are disabled people travelling less often (as is the general population), but they are also becoming less independent. I would welcome further research aiming to understand the reasons for this, and would be interested to hear about similar longitudinal studies. … include a couple of interesting projects for Living Streets Scotland. One involved reviewing Kirkintilloch’s new ’shared space’ street design for access and inclusion aspects. Secondly, I’ve been preparing a case study called ‘Streets for Everyone’, based on recent collaboration between Living Streets Scotland, Perth and Kinross Council and the Centre for Inclusive Living P&K. I’m also preparing workshops on this theme in Edinburgh, Glasgow and Perth. Finally, I am working with EVOC for a few months, looking at opportunities to redesign community transport support to a number of lunch clubs and day centres. I have produced this simple, short (2-page) guide on strategic planning for voluntary organisations and other not-for-profit bodies. I hope that this provides some useful tips and guidance especially for smaller organisations that may be daunted by some of the jargon and mystique that so often surrounds business planning. Feedback from anyone who uses this would be welcome! 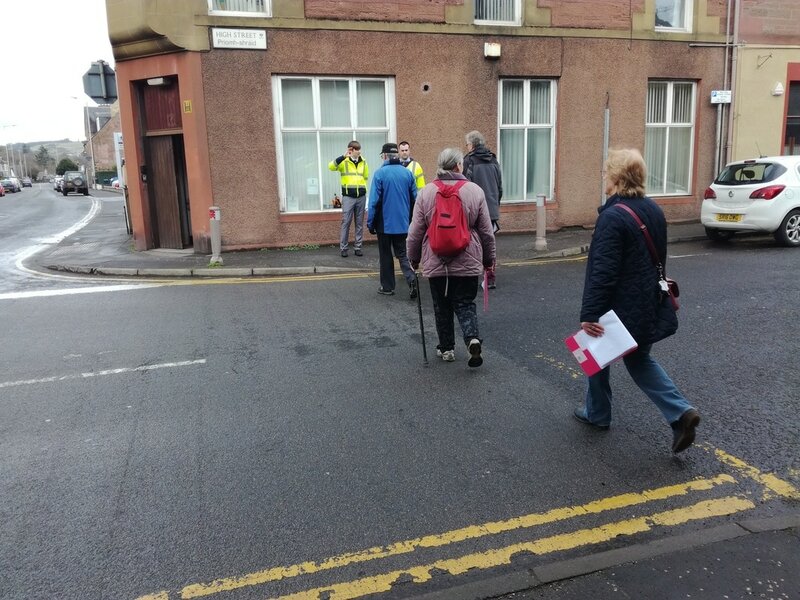 I was pleased to help Living Streets Scotland carry out a street audit in Blairgowrie and Rattray last month; part of a package of walking initiatives they are carrying out for Perth and Kinross Council. Although the context for a small town like Blairgowrie is different to major cities like Edinburgh or Glasgow, many of the issues are fundamentally the same: dominance of public space by traffic, inadequate pavements and difficulty crossing the road. Hopefully a few ‘quick wins’ will be delivered, as well as highlighting some of the tough long-term issues. I was pleased to be given the opportunity* to talk to the Rehabilitation International World Congress last week in Edinburgh about how involving disabled people in street audits can help make streets better for everyone (you can see the slides here ). These ‘inclusive design’ principles will also feature in the ‘Walkable Communities’ workshops I’m presenting for Living Streets Scotland later this month (see below). The poor state of British streets is a major obstacle to disabled peoples’ mobility. Significant problems exist with regard both to how streets are designed, and how they are managed. Effective systems for design and management will benefit everybody (not just disabled people) and need not cost anything at all, if built in from the outset. Official guidance on barrier-free street design (‘Inclusive Mobility’) is out of date and needs to be revised. The 2010 Equality Act has not yet been influential in improving streets for disabled people. The EHRC should bring forward more cases against authorities which fail to take into account the needs of disabled people in street design and maintenance works. I’ve been doing some interesting work over the past few months devising - and implementing - methods for reviewing the walkability of streets in Edinburgh. This work (as an associate for Living Streets Scotland) is funded through Transport Scotland's Smarter Choices Smarter Places programme. The work involved a number of technical reviews, logging the extent to which streets conform to the standards set out in the Council’s new Street Design Guidance along with a community street audit of the Cowgate. All streets reviewed are in the Council's capital maintenance programme over the next two years, so the findings can contribute not only to policy but also to the practical works on the ground. My new paper on the usage trends of UK dial-a-rides can be downloaded below. This research was carried out as part of my work with Edinburgh dial-a-ride HcL to produce a new organisational strategy (see below); their permission to publish this information is gratefully acknowledged. The study of ten UK services meets an important information gap, as data on the actual use of dial-a-ride is surprisingly hard to find. The research found that passenger ridership fell in eight of the ten services, and the average annual change in use was a fall of 2.4%. My conclusions are firstly that detailed research is needed to understand the reasons for these usage trends. But I think we also need to take a fresh look at the dial-a-ride model itself, in a time of more accessible buses and taxis and the rise in the number of Motability cars. Having been involved with dial-a-ride services for some thirty years, I hope that the research will encourage new and more imaginative thinking on how dial-a-rides can develop to meet disabled peoples' mobility needs. 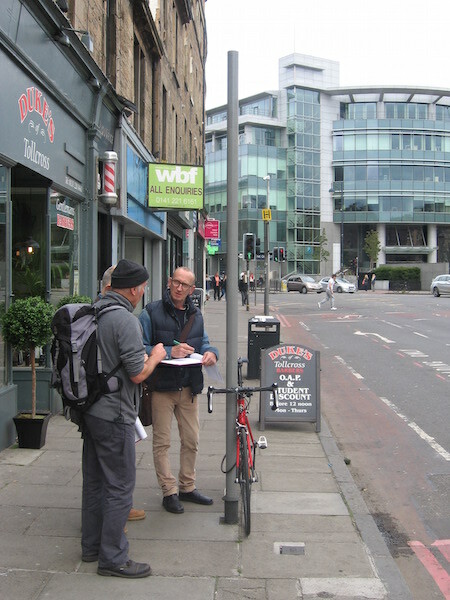 I recently organised a street audit in Edinburgh's Tollcross district for Living Streets Edinburgh (on a voluntary basis). Many of the problems identified are simple things - street clutter, poor pavement surfaces, etc - which can be easily fixed if there's a will. The obstacle presented by the Tollcross junction itself to people on foot is a more fundamental problem. The report has now been published on the Living Streets Edinburgh website - please see a link to the full report below. This was an interesting exercise with excellent involvement of the local community including the Community Council and Access Panel. Discussions are underway with the Council staff and I'm looking forward to seeing improvements on the ground soon! Update November 2015 - pleased to report that the derelict phone box in the picture has been removed! Pleased that HcL (Handicabs) have approved their interim strategy 'Opening Doors' following a major review of their services. The strategy focusses on the twin aims of continuing and improving dial-a-ride and Dial-a-Bus services, while also developing new innovations in meeting the needs of people with mobility challenges. Pleased to be working for Bòrd na Gàidhlig, helping to review progress on a number of statutory Gaelic Language Plans, in association with Meriel Young Consulting. Equally pleased to be working again with ﻿HcL, the long established accessible transport service, helping to develop long term strategy and business plans. The Scottish Accessible Transport Alliance (SATA) launched a proposed strategy to make Scotland's transport accessible to disabled people today (9 October 2014). Accompanied by an Action Plan of some 87 specific measures, SATA seeks support and comments from all involved in transport as providers, planners or users, by 16 January 2015. See the SATA website for full details. Update 5 November 2014: Pleased to see the Scotsman newspaper feature my article on the SATA strategy, written for CILT. The original text can be dowloaded below. Living Streets Scotland and the Scottish Disability Equality Forum have jointly published a new report (5 August 2014) analysing what each of Scotland's 32 councils say in their published equality outcomes about making streets and public spaces accessible to disabled people. Susan Grasekamp, SDEF Chief Executive Officer, said “We urge Local Authorities to make that commitment towards adopting a more inclusive approach to public spaces". As in its sister report 'Transport for All' (see below), the evidence shows that most councils have yet to make a link between equality outcomes and accessible mobility. David Hunter, who carried out the research and wrote the report, said "Every council in Scotland - rural or urban - should surely aspire to designing and maintaining streets that make our cities, towns and villages easy for everyone to get around. As councils review and revise their statutory equality outcomes, I hope that more local authorities will make formal commitment to really make 'Streets for All'. " Download the Streets for All report report below. Or see the Living Streets Scotland website or SDEF website. A new report - Transport for All? - analysing what Scottish Councils say about transport for disabled people has been published (15 May). It shows that fewer than half of Scottish councils say anything at all about disabled people’s transport needs in their published Equality Outcomes. The analysis of the equality outcome statements of councils (a legal requirement under the 2010 Equality Act) shows that only 14 out of 32 local authorities make any reference to accessible transport. assisting disabled motorists (Renfrewshire, South Lanarkshire).